Washington lighthouse, Hong Kong 10 years on, Atlantis return and the great Aussie petrol rip off. A friend of mine took a party of scouts to see this lighthouse I was amazed to see how orderly it was on this picture. 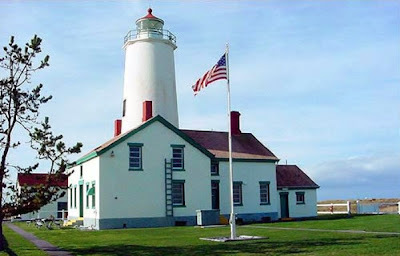 I know we have them here as I have been to a couple but this one in Sequim WA really does look in tip top condition, I guess they are not really needed now in this day and age but it seems they still have a lighthouse keeper, I do believe the light is lit but could not swear to it. Its also hosts wildlife and there are restricted areas but most marine life that are not in a restricted area are still protected as indeed they should be in my opinion. This is definitely well worth seeing if I ever get there and I am determined I will visit I shall go and look naturally. Hong Kong ten years on yeah well according to this news report Great Britain was definitely not snubbed at the celebrations and they were rather proud of the world class success by HK officials but would like the democratic process sped up a tad the Chinese mob in Beijing may well say this was not the case but of course it was. The Chinese want the best of both worlds no doubt one of the reasons for the snubbing but really I don’t care the lease on HK was up ten years ago and that was that. Welcome to Terra Firma brave crew of the Atlantis especially Sunita Williams world record holder for the longest human in space. This mission was put back for 3 months but in the end succeeded with doing the job it did a lot of work to the solar arrays on the ISS; this will provide electrical power for Europe’s Columbus laboratory. I bet Sunita found it strange after so much time in free fall. You all did a great job I reckon. Yeah the great petrol rip off I reckon they should be gaoled myself a bunch of crooks is all they are, its all on here. The head of the ACCC wants to gaol these crooks that are found guilty of price fixing and my view is yep do it it might make the greedy swine think a bit more; lets face it if I did this or it was a share fixing gaol would be on the cards so why should they get away with it is my thinking. 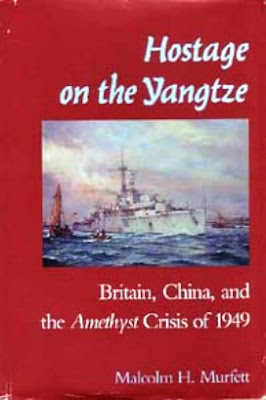 HM Ship Amethyst in 1949 steamed 104 miles about 160 kilometres down the Yangtze River and rejoined the fleet being fired on by the people’s liberation army of the red Chinese. This account here by Wikipedia has not given all the facts really in actual fact the ship whilst on a routine mission to Nanking (now called Nanjing) was driven ashore by heavy gunfire with a considerable loss of life. Damage and casualties also occurred with HM Ships London, Black Swan and the consort who gallantly tried to aid the frigate HMS Amethyst. What is not so well known is the fact that the radio operator sent messages back to the British fleet for a good twenty days without proper sleep and was awarded a bravery award of some kind. This incident was also made into a movie starring Richard Todd. A little bit of history now almost forgotten strangely the actual ship was used in the movie, the skipper was Lt Cdr J.S. Kerans D.S.O RN. Seems the Atlantis mission has been on overtime up above whilst we all ate worked and slept or whatever. 2 days and nights overtime hmmm with danger money wow. In all seriousness they fixed up the Atlantis so it will re-enter our atmosphere safely. 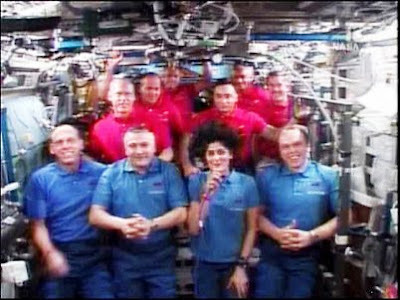 Sunita Williams pictured here now holds the record for being the longest human in space and did say people tend to forget things are still very dangerous up here in space she sure got that right. 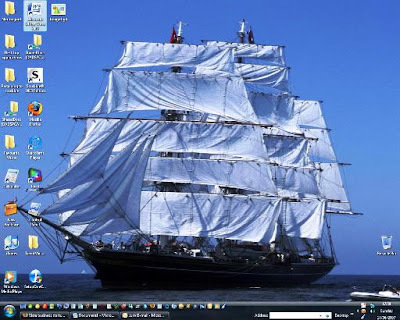 Actually it started a couple of days prior to the weekend’s fun and games with the installation of Vista Business and office 2007 I was a little wary and am not quite used to it as yet. At this moment in time I don’t recommend it my main grievance being that a lot of necessary programmes I use will not run on a Vista installation and this I might add includes antivirus and I did read on here it also affects messenger services I have not yet tried that out but to my utter disgust I could not use my choice of an antivirus programme that alone annoyed me. You can customise it a tad and kind of make some programmes look like windows XP, I did this at first but then thought no as after all it is a different system entirely and one cannot learn that way I figure that one note is something like word pad or notebook but very different as indeed is word itself. It also seems to have an annoying habit of turning the monitor screen black after clicking on certain things, I discovered this in outlook office mainly but it then reverts to the usual colour. I have only just found out how to enable my custom dictionary as it kept reverting to American English which I don’t use; don’t get me wrong here I could enable it but only for each e-mail but all is well now. As usual click on the images to view them they are of vista you can see the black I mentioned on the screenshot of my desktop; in actual fact it all goes black briefly for a second or so before it comes good. Will you buy it or won’t you that is the question it is not cheap but the home edition may be; home Premium or ultimate I read but I just have a business edition which was very expensive but then again it can be put on at least ten computers of your own a fee is paid to Microsoft annually for this. So go up to the pub or club discuss it with your mates and choose after a beer of course. Who do these morons think they are? 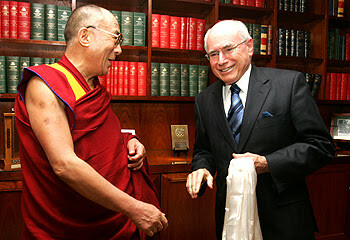 I think I speak for most Australians in saying that the gang of thugs that rule China have absolutely no right in saying what they are saying re our Government finally deciding to hold a conversation with his Holiness the Dalai Lama. I suggest readers and the Red Chinese Government read this article about a Roman catholic a cardinal from Hong Kong who has also been to Shanghai his name is Cardinal Joseph Zen Ze-kiun. I also read about footage of slaves in China and I suggest and none too politely either that the thugs who run this huge country look after their own instead of mouthing off to other countries as to what they should and should not do. I may be outspoken but I don’t really care I loathe the Red Chinese government. Yes our long weekend the head of states official birthday and Kerrie-Anne-Walsh writing in the Sydney Morning Herald wants it stopped; the excuses are so mundane excuses like Elizabeth has ruled over us for 55 years WRONG we are a monarchy true but we have a duly elected government who in effect governs our lives wake up Kerrie; she’s been here for 15 brief visits so what the less the better; if you did your homework Kerrie you would find that when the government a long time ago asked the Brits for her salary it was refused why should the good old Aussie taxpayer shell out hard earned Bucks to pay for her visit. Hence fewer visits Kerrie not very bright are you for a news hound. At the same time we cannot see the harm in having a public holiday at the governments excuse whatever the reason. Note well that the average Brit does not get this holiday by the way. A flag marshal and you don’t know what it means Kerrie so look it up in the Dictionary, just going on what you wrote in your article how did you score your job you don't need this holiday I agree so I hope you stayed at your desk. The average Aussie will take a holiday ok whatever it’s for but you need some education still so I suggest you swat up on your history lessons. This sort of thing happens quite regularly here in Oz to be honest; mine was acting up last night quite a lot very annoying when one is instant messaging etc. It mentions on here it was resolved by 10.30 PM well I can tell you I was in bed then but it was still happening today so that report is sheer B/S what’s new with newspaper reporting I guess we are all inured to it by now; the thing is it should not be happening at all; Telstra is obviously at fault in my opinion not a humble one either I just tell the truth as I see it. Something else I am not happy about is my ISP (WESTNET) who up till now have been a very good provider but today they certainly got my e-mail accounts in a right old mess. They insisted I had a different address such baloney I have two addresses one was ok and one was not and yet I could send myself a message on it. They are on the ball when your account is due but not on things like this. In all honesty I must say this is the first time since I have used them as my ISP that they got things horribly wrong, they have messed up at times true however the fact remains that they did so I reckon I have a legit reason for a grumble. Mind you if they don’t pull their socks up I shall find another provider. Deep down though I suspect Telstra is at the root of all broadband connections noticed their shares lately have you. Their commander in chief gets a larger salary than our present incumbent Prime Minister’s how big and generous of Telstra’s shareholders to grant this I (don’t think). The sooner we get a fibre optic network the better in my opinion. I read all this rubbish in our newspapers (online naturally) but the standard of reporting is slack bloody slack. I may make the occasional error it’s true but I try to research a post before I post it on the internet. Most folk wonder why I am not a lover of the Red Chinese Government but I don’t really care I just don't love them and this video clip is not about their government as much as their bloodthirsty citizens not all of them naturally but a lot are mere babes and children one wonders why these babes are allowed to see such cruelty . This is merely one of many disgusting bestial things that the Red Chinese allow; they have good reasons for permitting this and here is my government kowtowing to them every step of the way. But first of all I am reminding them of the disgusting manner in which they portrayed themselves during the battle of Tiananmen Square. Freedom to the Chinese will not be allowed in my lifetime I know that as a certainty but it may happen; it did in Russia after all but nobody really knows. Look at the way they decided to make Tibet part of China again as I believe it was very many years ago long before Mao and his band of thugs took charge. Tibet was once the happiest land on Earth; traditionally ruled by the Dalai Lama but in 1949 those thugs invaded under the label of the peoples liberation Army they even used MIG Fighter aircraft to attack Lhasa the capital city of Tibet. The occupation of Tibet has completely changed lives and lifestyles of Tibetan Citizens and not to better them indeed they are much worse off now under the harsh regime of these Chinese thugs. During the invasion and even now I read Monks and Nuns were raped in Chinese prisons this is the same Government Mr Howard you kowtow to. It is a wonder you can sleep at night I sure couldn’t. The Dalai Lamas photos are banned; according to a document captured by guerrillas who fought the Chinese army from 1959 until 1960 the number of Tibetans killed after torture and the inevitable starvation that followed exceeded a million so I would say many more now. Your barbaric practices are much known by us in the west so not only Tiananmen Square then but the bestial zoos you have Here first is a video on the massacre of your own citizens who stood up to you well they gave it their best shot I don’t suppose they actually thought that you thuggish lot would go through with it. I am talking of the Japanese now with their whaling programme; and I don’t like the idea of them stirring up trouble trying to get at what we regard as our whales. If the Australian and New Zealand governments cannot stop the Japanese from this farce of killing the Minke Whale for scientific research why do they want our Humpbacks; I’ll tell you why plain and simple it is for them to eat greed is written all over their faces and it really gets up their noses when Greenpeace has a shot at them I am with Greenpeace all the way let them import their food like other countries who are in a similar position to the Japanese. There is a moratorium on this subject and the Japanese are doing their damdest to walk over the rest of the world. 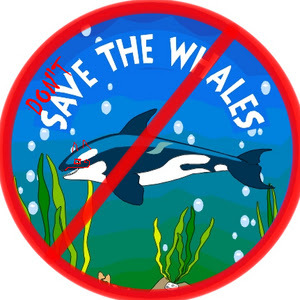 We need support on this we don’t need whale flesh to eat; we don’t need by-products from whales anymore nor do the Japanese either; there are times when I seriously wonder who beat Japan in W11 Americans and their allies gave into them far too easily in my opinion. Now I read how the Queen of the UK and several commonwealth countries sat down and had dinner with the Emperor of Japan who in days not so long ago was regarded and indeed treated like a God instead of a normal human being like most of us. I do not believe in war especially in today’s climate but when the Japanese were finally thwarted over their horrendous acts towards several countries in my area on the Pacific Rim; the supreme penalty should have been paid by the head of this small nation. It was not of course and is far too late to emend it in fact we should not emend it in my opinion but it gets me going when I read and see on my TV the way in which the Japanese treat anything and anybody.